Summary: Public policy in America has become a debate about myths, as our broken OODA loops degrade our ability to see and reason — and we become more easily influenced by propaganda. That’s a natural response by our elites; a sensible person doesn’t attempt to reason with sheep. We see all these factors at work in the debate about gun control. Here we briefly look at two myths, the 5th chapter in this series. 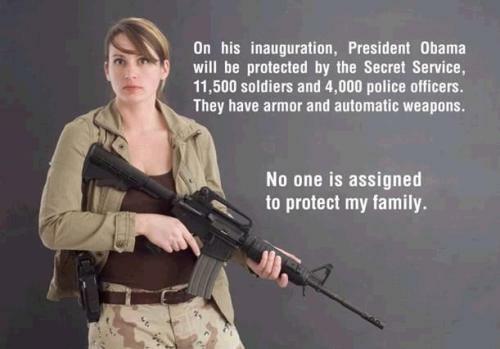 Their mad vision for American society: one where each family must worry about defending themselves. Photo by Oleg Volk. The two powerful photos on the right are by Oleg Volk, from his website Volk Studio. It’s daft, and has little factual support. In fact widespread gun ownership is associated with dangerous, lawless societies — both today and the in past, in the US and around the world. Reductions in the number of people carrying of guns leads to less violence. One of the amazing things about America is the large numbers who believe astonishing things. This and disbelief in evolution are high on the lists of things future historians find marvelous about us. Here are a few snippets from the large body of evidence on this subject. Of course, no matter how large it will change no minds. (a) Do more guns reduce crime? “Even gangsters live in fear of Japan’s gun laws“, Japan Times, 6 January 2012 — A different culture, but we can learn from them. Paranoia; getting ready to shoot his child sneaking back in the house. Photo by Greg Volk. Sometimes guns are successfully used in self-defense. Such as this story. These get massive play on the right, creating an exaggerated impression of guns’ utility. But sometimes defending one’s possessions (ie, the insurance company) yourself killed (as in this story). Most often guns don’t help because murder victims know their killers (80% per the Dept of Justice’s Murder in Large Urban Counties study (1988; summary here, pdf here). Guns seldom prevent murder from relatives (18%), friends, or associates (but often get used to kill relatives, friends, and associates). CARNESVILLE, Ga. — Keith Ratliff loved guns. He built his own rifles. He kept bullets in his car’s cup holder. And on the rear window he slapped a sticker of the Starbucks Coffee mermaid firing two pistols. “I ♥ Guns and Coffee,” it read. Mr. Ratliff’s passion for firearms made him something of a celebrity on the Internet, where he helped make scores of videos about high-powered and exotic guns and explosives. His YouTube channel, called FPSRussia, became the site’s ninth largest, with nearly 3.5 million subscribers and more than 500 million views. But last week, the authorities said, Mr. Ratliff, 32, ended up on the wrong end of a gun. The police in northeast Georgia found him dead at his office on Jan. 3, shot once in the head. He was surrounded by several guns, but not the one that killed him. The Georgia Bureau of Investigation is treating it as a homicide. (a) Important: Mass Shootings in the United States Since 2005, Brady Campaign website — It’s 62 pages long. “The Declining Culture of Guns and Violence in the United States“, Patrick Egan (Asst Prof Politics, NYU), the Monkey Cage, 21 July 2012. (d) “The Price of Gun Control“, Dan Baum (author of author of Gun Guys: A Road Trip), Harper’s, 20 July 2012 — The price of gun control is very high, and we might not get much in return. (e) The CDC is not known for its advocacy for the 2nd amendment, so this result deserves attention: “Firearms laws and the reduction of violence: A systematic review“, American Journal of Preventive Medicine, February 2005 — By the Centers for Disease Control’s Task Force on Community Preventive Services. Previous Post Why comments have been turned off on the FM website. It’s the same reason others have done so. This whole discourse omits the reasons Americans want guns. Americans have a large amount of minorities that are murderous, rob, beat and assault people in large numbers. People want control over their own lives so they don’t want to their fate to be up to the police or government which haven’t shown to be an effective deterrent to the thugs. However ineffective gun ownership has proved to mitigate threats to people lives, you give “one” example which could be countered by a vast amount showing different results, all people at least want a chance to control their destiny. We also don’t want to be like the Russians who were taken over by the Bolsheviks,(Jews), who proceeded to massacre the Russians in vast multi-millions numbers. As it is now no army or tyrant could defeat us if we did not wish it so. There’s too many gun owners. Amen Sam , if that was the only reason it would be reason enough. People do not seem to learn from history. I hope America never gives up those guns. It’s not much but it’s the only thing between us and a tyrannical government or an angry ignorant mob. I for one will not allow my life to be hindered or taken without self defense. I’ve learned over and over again that the only one who will protect me is me. I cannot depend on anyone else especially a police force that has no duty to defend me all he does is defend the corporation and generate revenue. They are real highwaymen, I always feel like I am being robbed and infringed upon when ever I see those red and blue lights .. officer friendly died in 1959. Welcome to the police state where the most dangerous position you can be in is pulled over by a guy with a gun and a tazer. One wrong word and you could be dead. I never argue with them or it’s judge jury and executioner right there .. get away and deal in the administrative or just pay. Doesn’t this all make you feel so freakin free. ??? Human beings are visual creatures, meaning we get information most efficiently when we can get a valid picture that corresponds to reality. First, look at a map of any City with dots on it representing criminal use of firearms (murder, domestic abuse, negligent discharge). Then look at the same thing over the last 20 years. What you will see is that, year after year, the dots are in the same neighborhoods and are virtually absent in many others. Then explain why the dot free areas should favor strict gun control – ie, disarming themselves. Next, look at the trend lines for criminal use of firearms for the nation of Australia and (for example) the State of Texas. They both have almost exactly the same population and are both highly urbanized. And, critically, they both had mass shootings about 25 years ago with ~ 30 killed. One place went far in the direction of removing firearms. The other allowed, for the first time ever, a licensing process for lawfully carrying a concealed handgun, then unlicensed carry in a vehicle, then open carry for concealed carry permit holders. And, by the way, the addition of literally millions of the same type of guns (AR 15s/semi-automatics) that Oz made such expensive efforts to remove. You cannot tell them apart. Both are down by about 50%. For anybody who looks at data for a living, that is called “no effect.” I mean, considering how extremely different were the directions taken, one should have seen something obvious if there was a meaningful impact. Along the same lines, in the 1970s, rural interstates here were posted with 55 mph speed limit signs. In the 1980s it went to 65, then 75. Now it is 85. And you know what, nothing changed regarding any measure-able outcome. I do not pretend to know all the causal factors in either case. But I can tell you that ordinary people here (and law enforcement) does not want to back to the old days of 55 mph speed limits and no legal carry. Law enforcement especially does not want to become more hated for no benefit to society. To sell Oz level gun confiscation here, this is what you are up against. By the way, no one will ever believe that those who would start the low level civil that would be gun confiscation would be doing it to lower the suicide rate. No, it would be seen as one political faction trying to disarm its opposition – full stop. How is the image a mad vision of American society? My father owning a LEGAL firearm has defended us from an armed home invader, who probably owned his firearm illegally. I sincerely believe you grew up in a sheltered neighborhood. Wrong. Guess less. Think more. The easy assumption is that you want a third world-like America, where “where each family must worry about defending themselves.” Like Mexico, Somalia, and other nations like that. But my guess is that you just didn’t think about what you read. “Vision for America” means what we want for America’s future. Assuming that story is true, is that what you what America to be? Where everybody has to worry about armed intruders, clutching their guns in preparation for self-defense. That would be considered quite mad in pretty much every other developed nation on the planet. Each to their own, I guess.